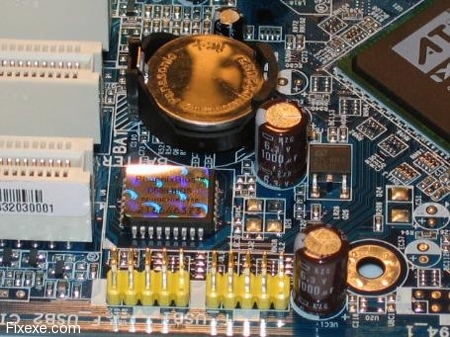 There are a couple ways to clear the BIOS or CMOS as it may be labeled on your motherboard. 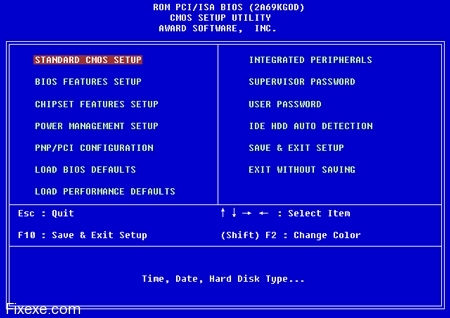 There are two ways to reset your BIOS even if you are not visually accessible to it. The first step is finding your power box in the back of your desktop. (In most cases it is on top of the desktop). When you found the power box you should notice a removable power cord connecting to your power box. Pull the removable cable out of your power box. Then open your desktop by taking of the lid in order to access your mother board with the jumper on it. The jumper is a two pin connector located on a 3 pin stand. After doing so locate the flat battery which is placed on your motherboard. In most cases the battery is a round component with a silver coating. Next to the battery should be a jumper like the one shown above. Now be careful because most motherboards have two or more of these jumpers. Make sure your Jumper says BIOS or CMOS. If it doesn’t try finding a different jumper. When you do find the right jumper pull the two pin connector and put it on the opposite side, the clear CMOS/BIOS side. Then press the power button on your computer with the power cord unplugged. When you have completed the last steep put the cases lid back on. After you done so screw all the screws back where they belong and plug the power cord back in the power box. Try starting your computer. When your computer boots it should notify you the BIOS is cleared. Some computers require you to restart your computer after that message. If the computer prompts you to do so then follow it’s command (press F# or press the power button again). Another way to reset your BIOS is by removing your battery. You can do this by doing step one and two as I mentioned above. After you finish open your desktop case (if necessary to access the motherboard) and then remove the battery I described above. Wait 30 minutes before putting it back in. When you did plug the power back in, screw the cover back on, and turn your computer on. Computer with XP, BIOS boot set 1) hard disk, 2) floppy 3)CD-ROM. Wouldn’t allow me to change it so that floppy was #1, CD-ROM #2 then #3 is hard disk. Removed battery as you suggested. That was the solution! Never would have thought of it myself. Thanks! Battery was old. online communicate the programs to can? when we format our pc with windows 7/vista then it didnot format. but when format with xp then it is formated.